Axis C1004-E network cabinet speaker makes audio smart and easy, and opens up a wealth of possibilities. 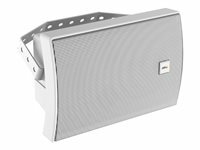 The speaker system is perfect for background music and for live and scheduled announcements in retail stores. Axis C1004-E can be mounted horizontally or vertically. Splash-proof construction means, it can be installed under the eaves, where it's not directly exposed to rain.